2 Games today with eVyros. Same list both games, was. 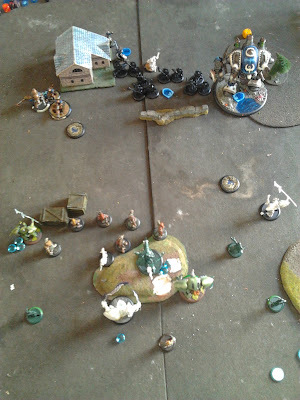 First game was against Cygnar. 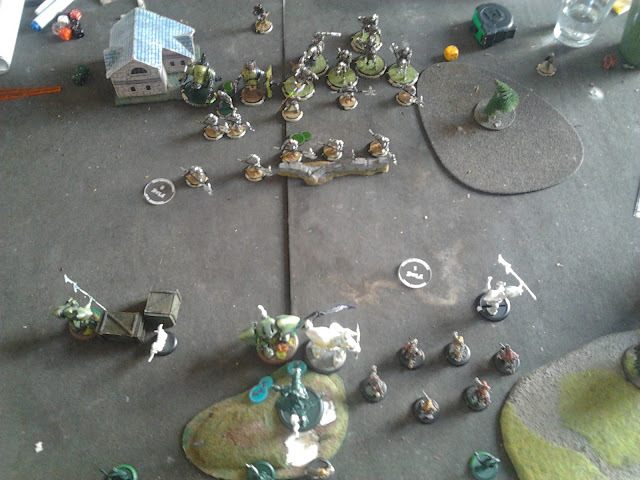 Dwarven hammerfall unit, guys with weapon master reach attacks. Striker? 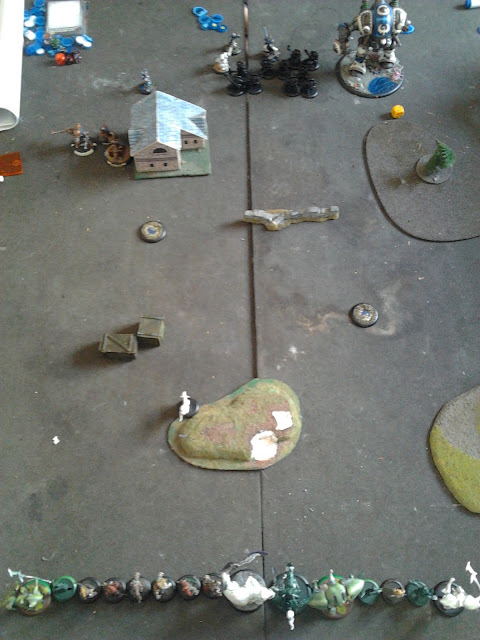 a Grenadier and stormwall. I can never tell whats what in Cygnar, all the jacks look mostly the same with storm something in the name or they are small and annoying but die to a stiff breeze. Same goes for the caster, not one stands out apart from Darius who's the guy in the fat suit and the Pole Dancer. The rest are all dudes in goggles. Now my record against this opponent is about 50/50. Thats not to say I'm a great player or he is a bad one, but I tend to just kick the ball into my own goal against him rather frequently. Its slightly confusing as Cygnar in general is supposed to be fairly assassinatable and on average I think we are considered players of relative skill. Watching these games however one may be more inclined to think I was the village idiot being encouraged to partake in a game of craps with 2 small rabies infested shaven and polka doted ravenous marmosets. All fun and games till someone loses a finger. Now previously I just threw pictures in with no indication at all to what they could possibly be. To the trained eye some things may have been recognizable. To the untrained eye, too bad I cant be bothered explaining or drawing little arrows in Inkscape. Between the Griffon and the Banshee are my unit of farrow battle mages. The proxies. Vyros advances to the hill the Griffons take up flank. 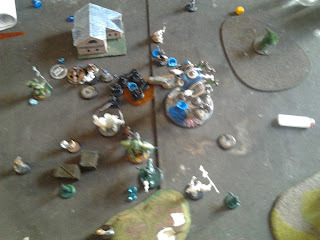 Second turn I kill off some Forge guard or whatever they are, who cares dead dwarves. Drop a covering fire. At this point I was perhaps overly cautious of Stryker or Caine or whoever he is. From now on he is Fancy Pants from earthquaking me and shooting me to bits so I kept 2 focus and hung back. Popped feat.The Griffon ran up and scrapped the grenadier, good stuff. 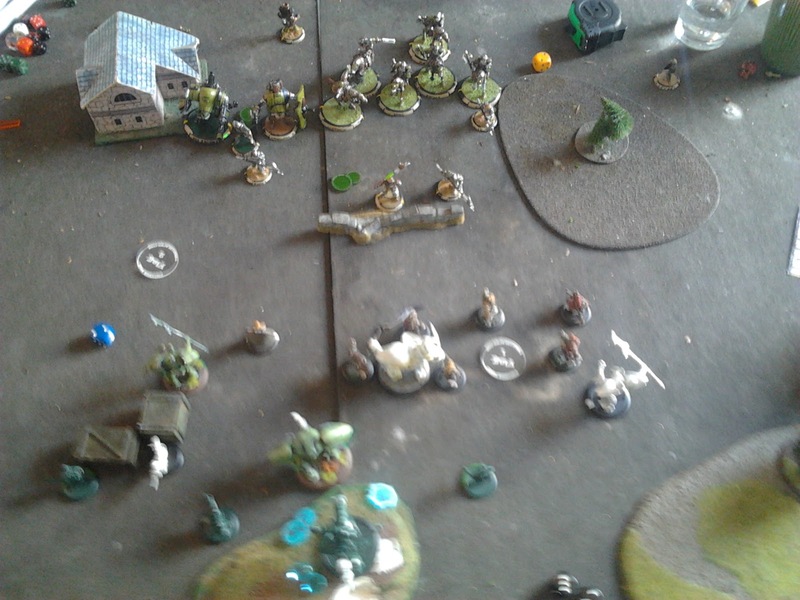 His second turn, maybe: The Stormwall moseys on over and kills a hand full of my battle mages, triggering a few feat repositions. its always during this reposition that I'm doing something wrong. In the last few games Vyros has failed utterly to assassinate needing something like oh I dont know 9's to hit with boosts. Anyway in this case I was like NO I wont do it, he has feated and has loads of armor or something and Vyros always fails. 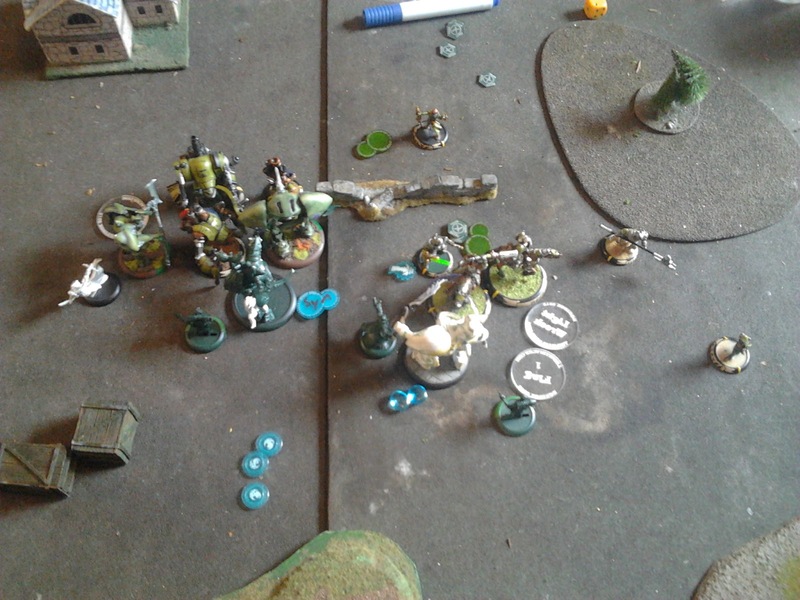 Instead I pick the worse option and charge the Stormwall with Vyros and 3 Jacks under feat. 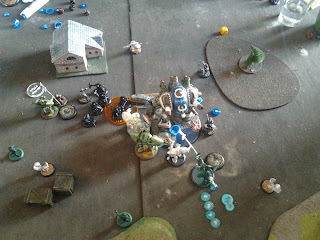 Also for some reason I didnt upkeep synergy so I was down 2 focus output worth of damage. 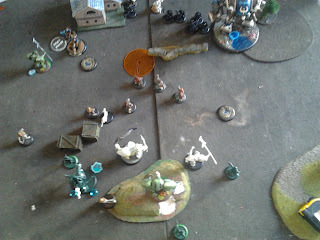 This left me in a rather uncomfortable position of being very close to the Stormwall with no focus up. Its ok, I'm Vyros I can tank this.... I was worried about him getting the earthquake in on me and doing it the easy way but his caster Fancy Pants walked too close to the banshee and was unable to cast spells. Unfortunately here is another person who can roll 9's on 3 dice and Vyros died, mostly to my foolishness. In actual fact it came down to a 50/50 roll after the 50/50 to hit rolls, so it was about a 25% chance or something. Whatever it was it sucked, and Vyros died. What I'm asking myself is, is it my play style (being terrible) or my list that's letting me down more. Game 2: Looks familiar don't it. Look its Mercs... Ahh silly mercs lets see there was Damiano, and cavalry and halberds and Rocinante Rupert and Eyriss and stuff. Bourne style motion blur for extra action and headaches. I use my feat turn badly (no surprise there) and leave all of my jacks within charge range of his cavalry with martial discipline. But he rolls badly and none of my Jacks die, my Mechanic walks up and repairs the Banshee 6 points leaving it operational again. 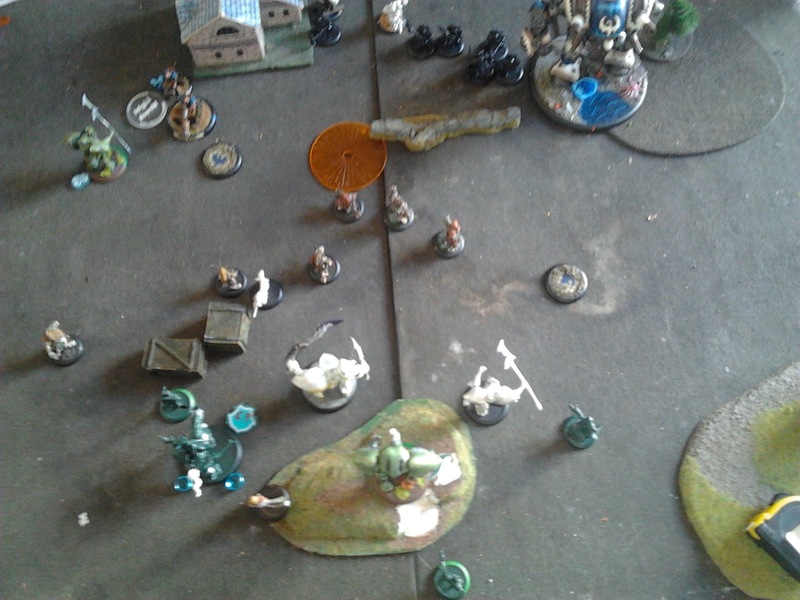 The Manticore took 3 focus with the intention of killing the light jack. 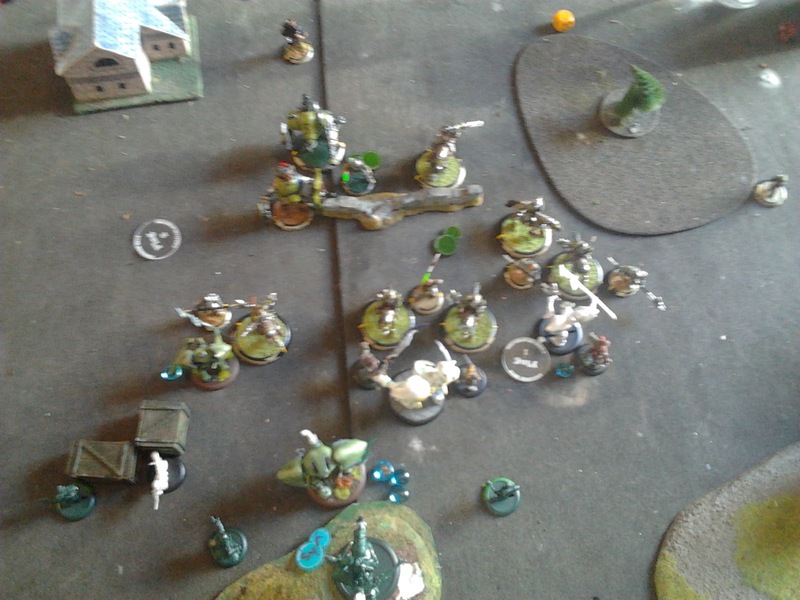 Vyros, the Magister and the jacks clear out all the infantry even though Damiano had feated. I was getting lucky now. The Manticore charged in and for the lure of doing a massive combo smite on the end of a synergy chain I made the star attack. Which in fact only did 14 points of damage and left me with no focus. 1 to charge 1 to boost to hit, oh and 1 attack after which did a little. If I wasn't stupid and just hit it 4 times I probably would have killed it. Because I couldn't I didn't score off the point. Which results in him being on the end of a recently repaired Banshee's synergy chain. A victory but a rather empty one at that. I felt like I used my feat badly, got off comparatively scott free after his cav charge and then was handed a silver platter victory wrapped in a pair of Megan Fox's undies. So a not so convincing win and a rather convincing but uninspiring loss. 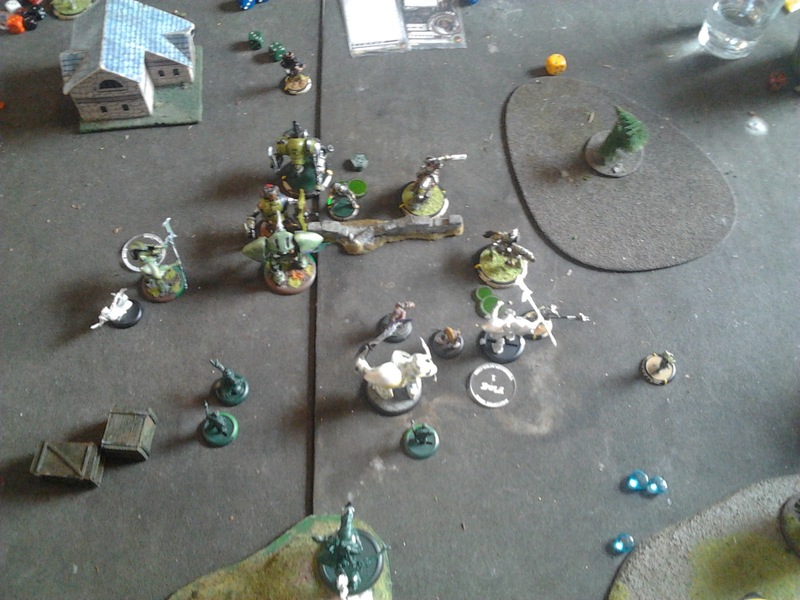 Dont know what to make of eVyros yet, some feedback suggests the list is ok. For grated I tried to wreck an armor 27 Stormwall (Eyriss was free struck by a Trencher crew with double 6's) But even at armor 24 I wouldn't have killed it. Should I bank on Hyperion showing up in time, learn to love eVyros and just get better with him or make a better list. Time is running out for Battlecry. What are you using the feat moves for? 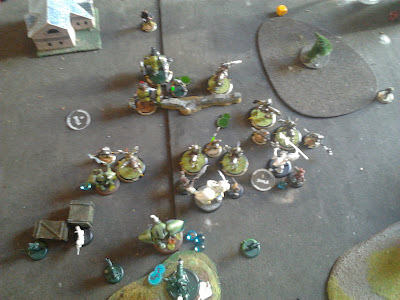 Against the mercs one Griffon moved up to hold the flag but was in charge, the Banshee moved back but was still engaged by the Halberdier, I was worried about the free strike. Against cygnar I really wasnt in a good position to use the feat anyway, nothing could reposition to threaten anything any better than it already was, I just decided to go for the Stormwall than kill all of his infantry, support and maybe put some damage on his caster.